The model that is available in this new Unimodel kit is basically a Russian self-propelled gun. 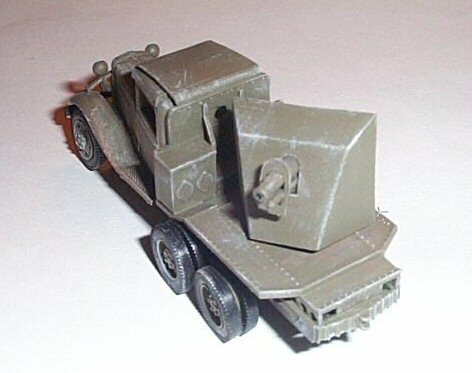 Specifically, it is a GAZ-AAA truck mounting a 76mm gun, with quite an interesting history. The gun being a 76.2mm Model 1927 Regimental cannon; it was a modernized version of the 1913 short-barreled 3-in. gun. The GAZ-AAA truck was used by the Russians throughout World War 2 in a variety of different designs. 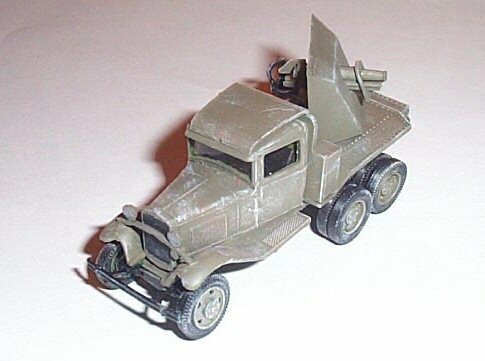 Some of the GAZ-AAA trucks were used as fuel trucks, some as armored cars, some as supply trucks and this vehicle, which is a self-propelled gun. GAZ, translated as “Gorky Automobile Plant” began producing vehicles, both cars and trucks about 1929. At that time, the USSR and the Ford Motor Company signed an agreement establishing and commissioning mass production of Ford Model A passenger cars and Ford – AA trucks. The initial GAZ-A and GAZ-AA vehicles were manufactured using drawings provided by Ford Motor Company. However, they differed from their American proto-types due to their reinforced clutch case and steering mechanism. 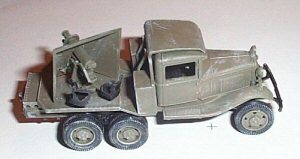 The GAZ-AAA 3-axle truck went into production by the end of 1934 and was produced all during the war years. The kit comes in an end opening box with an artist’s painting of the actual gun in deployment. The reverse side of the box has a painting guide with colors specified in the Humbrol range. A three-view colored drawing also shows the finished vehicle from different angles. The parts include 91 well-molded plastic pieces attached to five sprues, a bag of 11 vinyl tires and an acetate sheet for the windows. There was very little flash on the pieces that were in my kit. These last two items are a very nice touch, as you don’t have to paint the tires or worry about what to do with the windows. The acetate is marked for cutting too, which is an added bonus with a kit this small. There are several parts which you will not use in the construction, that are identified as such on the instruction sheet. The instruction sheet shows the assembly in 13 steps, each step an exploded drawing of how parts are to be assembled. There are no decals or markings, at least there were none in the kit I received. I will start right out and say that this kit is not for the faint of heart or a newcomer to the hobby. It is a sweet little kit, but be wary of the fifth word in this sentence; the kit is LITTLE and so are the parts! 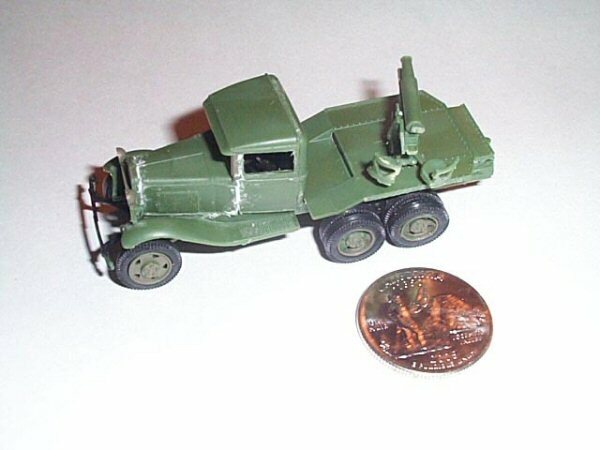 However, for a kit this small there is almost as much detail as there is in 1/35 scale kits. Construction begins with the assembly of the chassis, wheels and tires. This takes you through the first 4 steps of construction. Everything goes together very well, and I really like the addition of the vinyl tires. Just be careful when removing the vinyl sprue between each tire so that you don’t leave a rubbery stem behind. I tried to cut as close as I could to the tire without damaging it. I did leave one or two stems behind and I was able to sand them down to where they are not noticeable. In step four, the instructions have you attaching the engine (yes you get to build an engine in this baby) to the chassis. However, the place the instructions show you attaching it will not match up with the hole that is cut into the bottom of the cab. I found this out the hard way and had to carefully remove the engine from its mounting. Just set the engine aside and mount it to the bottom of the cab when that section is completed. Additionally, watch when removing some of the smaller pieces from their sprues. In step 3, you attach the front bumper to the front section of the chassis. When I cut this off the sprue, it was so thin and fiddly that it broke in two. I ended up gluing it to the chassis and then, very carefully, gluing the section together that was broken. The next two steps, 5 and 6, really gave me all kinds of fits. This is the assembly of the truck cab interior and exterior. First, the instructions show you, via an icon, having to file something down on the front left fender. The drawing is very unclear, and of course there is no wording, so I guess you have to file something down. I did the best I could, for what I don’t know. Second, the instructions, in step 5 have you attaching the radiator screen to the front of the cab/fenders. Don’t do it, or you will be in trouble with the fit of the entire cab section. Wait and assemble to radiator screen to the entire engine hood assembly in Step 6 and attach it to the cab/fender section. Everything else in Step 5 is pretty straight forward. You might want to paint your interior sections now, which include the seat bottom/cushion, steering column and wheel and gear shifts, floorboards and pedals. I was unsure what color to paint the interior floorboards, so I used Testors Dark Olive for most of the interior. I used flat black for the seat, pedals, steering column and wheel. Step 6 is completing the cab and this is pretty tricky as you are working with some very small and fiddly parts. 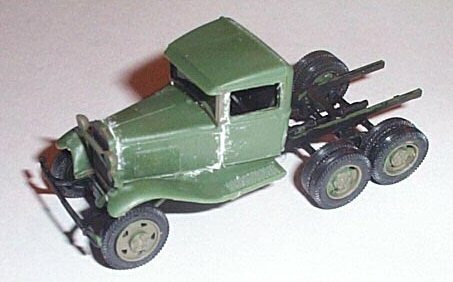 I assembled the entire front engine hood and sides, including radiator screen, as one unit and attached it to the cab/fender section. You then have to carefully cut out the acetate front window and attach it to the dashboard/windscreen section. I used white glue to attach the acetate. You need a small pair of scissors to cut around the pre-marked sections. You then carefully attach the two side doors, I left the acetate off here making it looked as if the windows were rolled down. Finally you attach the seat back and rear of the cab to the fender section. If you have done everything right, it should match up perfectly so that the roof can then be attached. I also used white glue to attach the rear window in its place. Before attaching the roof, I weathered the interior a bit. You will be unable to any interior weathering after the roof is put on. The next few steps, 7-9, are the assembly of the 76mm gun to its mount and shield. The gun, being very small and short-barreled, is still pretty detailed. Everything went together quite well, except for the two seats provided for the gunner and pointer. The seats are attached to a sprue of plastic, which is then attached to the gun mount at about 45 degree angles. There are no slots for the seat attachments to fit into, so you are left basically guessing and looking at drawings of the finished model to determine if the seats are attached correctly. I also drilled out the end of the barrel to make it look more realistic. The last few steps have you assembling the truck bed, gluing the cab to the chassis, completing work beneath the chassis and cab and finishing up work on the truck bed. These last few steps are pretty straight forward and not too difficult. I basically followed the guide that is provided both in the instruction sheet and the back panel of the box. I did not use Humbrol paints, but used Testors Acrylic paints. I painted most of the model with Olive Drab as the painting guide indicates a Matt Light Olive. Most of the chassis and empennages beneath were painted Flat Black, as well as the seats attached to the gun. No acetate headlamps were provided, so I painted the headlights silver. Weathering was done by dry-brushing with a lighter color added to the olive drab. I enjoyed assembling this kit and learning a little bit more about the history of Russian armored vehicles of World War 2. The kit is, for the most part, pretty easy to construct. The difficulties I had were with the engine placement and the hood assembly. Also, be aware that the parts are quite small and are sometimes prone to breakage, if not careful. 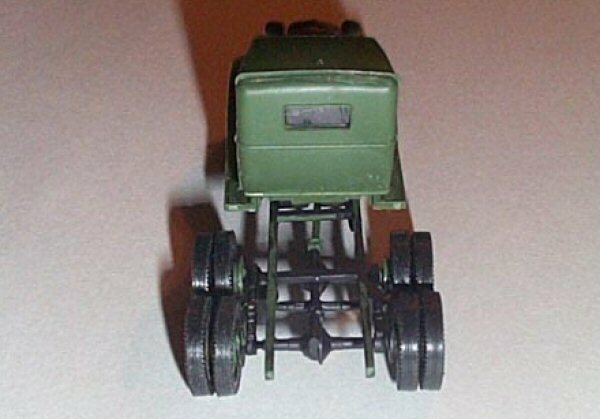 Additionally, the instructions could be made clearer in places where they show you assembling the engine to the chassis and where you are supposed to file. I would recommend this for those who have experience with building smaller model kits and/or experienced modelers in general. I would also recommend it to anyone interested in small scale Russian vehicles.